About the ILoveLucid Blog | I Love Lucid… Dreaming! 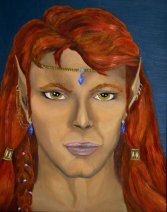 Me, my elf and I.
I’m William Ember, an author and explorer of Lucid Dreaming, Out of Body Experiences and Astral Projection. My main works on how to have and enjoy these experiences to the max is the Ultimate Astral Experience Course. The ILoveLucid blog is a central hub for insights and discussion of these topics, written and managed by yours truly. Enjoy!